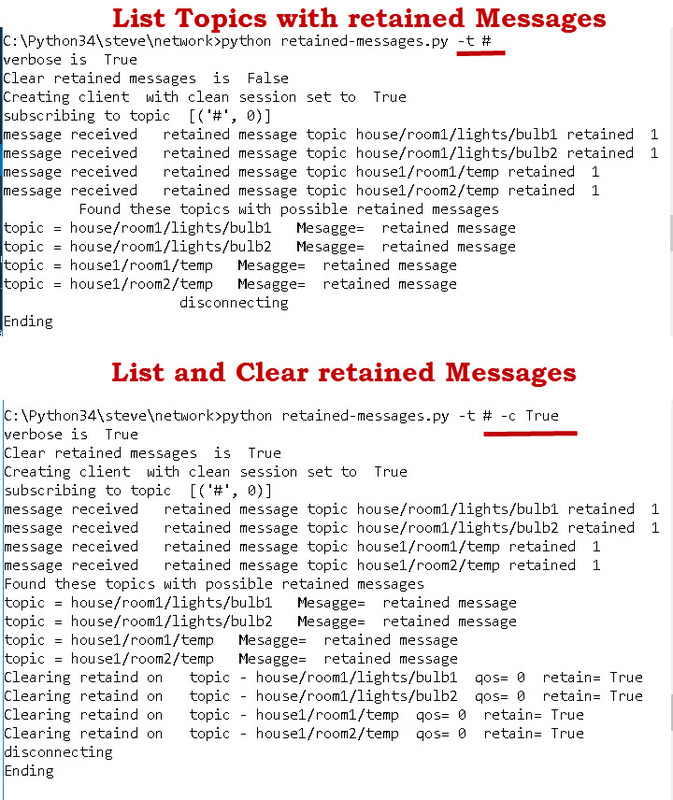 This MQTT testing tool is a simple Python script that will list topics that have a retained message and optionally deletes the retained message. The script can be use from the command prompt by supplying options. The script requires only two parameters which are the broker IP or domain name and topic. The script checks for a valid topic before continuing. Now we initialize some flags using the Initialise_client_object function and the callbacks using the Initialise_clients function. The script then tries to connect to the broker and uses a try except block to catch connection errors as explained in detail in understanding client connections. Now we start a loop to process callbacks. It then waits is loop for the connection to be acknowledged. Notice the use of the flags that are set and reset in the on_connect callback. If the connection acknowledgement is bad the script exits if it is good it then it subscribes to a topic. It then waits in a loop for the subscription to be acknowledged. We then wait a set period as all of the work is now being handled by the on_message callback. The message.retained variable contains the retained flag which is 1 for a retained message. If it is retained it stores the topic. After the delay expires the script will print out the list of topics with retained messages and then if the clear flag is set it will clear the retained flag. This function clears the retained flag by publishing a empty message (msg=””) with the retained flag set. Run with the -h option to list options. The script can be run from command prompt but it is easier to edit, and run in the IDE or from the command prompt with no options.